With incredible men’s and women’s ski slopestyle contests now in the bag, freeskiing action at the 2018 PyeongChang Olympics now moves to the halfpipe. With a talented field including all six medalists from the last Olympics and a halfpipe that the riders have been praising to the moon, it’s shaping up to be one hell of a show. Here’s a look at which riders to keep an eye on. Team Canada has come to PyeongChang with a stellar pipe team. Mike Riddle is the defending Olympic silver medalist and at age 31, a veteran halfpipe competitor whose talent has ripened like a fine wine. Simon D’Artois won X Games in 2015 and is known for huge amplitude in highly technical runs. Last but not least, Noah Bowman is the “Pipe Whisperer” of switch halfpipe skiing and can link flawless switch doubles with impeccable style. All three are capable of putting down a medal-winning run. Rolland has been France’s best halfpipe skier since seemingly forever and owns a vast collection of precious metal that includes a bronze medal from the 2014 Sochi Olympics. He injured his shoulder right before the Olympics but will still be skiing, and has never been one to let a little thing like pain hold him back. Rolland is one of the most motivated competitors at this Olympics—in halfpipe and in general. With four of the world’s best halfpipe skiers on their team, the Americans will be disappointed if they don’t take home at least one medal. Defending Olympic gold medalist David Wise is riding high after a clutch win at the X Games last month—can he keep the streak going? He’s got stiff competition in Torin Yater-Wallace, one of the smoothest operators and hungriest competitors in the pipe. Alex Ferreira is right up there as well, as is Aaron Blunck. New Zealand is represented in the pipe by two different sibling pairs: Byron and Beau-James Wells and Nico and Miguel Porteous. Byron will be extra motivated after dropping out of the 2014 Olympics after a knee injury during training, while Beau-James competed in Slopestyle in 2014 but has made the switch to halfpipe this time around. Both can put down high-scoring pipe runs, and the signature Wells family style is always a pleasure to watch. Meanwhile, the young Porteous brothers are long-shot podium bets, but a quick Instagram check confirms that both have the pipe-skiing prowess to contend in PyeongChang, and maybe bring out some surprises. Beau-James Wells was the flagbearer for Team NZ at the opening ceremonies. Sharpe placed first in today’s qualification round with bold, confident skiing that sets her apart from the field. She’s got big, clean cork 900s on both walls and a cork 1080 at the bottom that’s a deal-sealer. If she lands her tricks clean and gets those grabs, it’s hard not to see her on the podium. Three Americans have qualified for halfpipe finals: Brita Sigourney, Maddie Bowman and Annalisa Drew. Sigourney’s got the biggest amplitude in the whole field, scraping the 5-meter mark on some of her hits, but only has a 900 in one direction and doesn’t do much switch skiing in her runs. Maddie Bowman is one of the winningest women in halfpipe ever and the defending gold medalist; she’s got both 900s and can spin switch, but the judges have a critical eye on her amplitude and grabs. Annalisa Drew has both 900s also and an alley-oop flatspin 540, but her style on the spins will be a topic of debate in the judges’ booth. A well-known freeski pro in the 2000s, Martinod returned from retirement to compete in halfpipe at the 2014 Olympics, where she took the silver medal. Four years later, this 33-year-old mother of two is still holding her own against competitors half her age. Her style hearkens back to the basics: smooth spins and clean grabs. While she’s not the most technically innovative pipe skier, her consistency and experience shouldn’t be undervalued. The bronze medalist from Sochi returns for another go of it in PyeongChang. 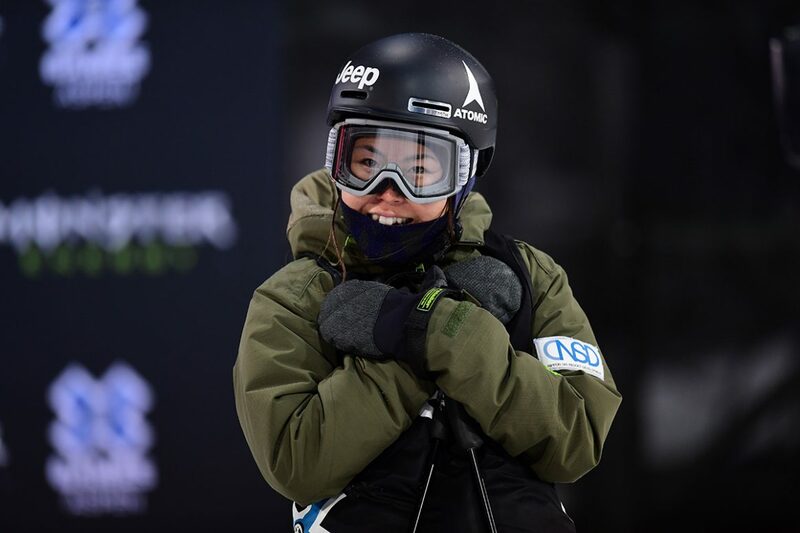 Onozuka is one of the most powerful pipe skiers in the field, with the right mix of amplitude, grabs and technicality to put her in podium contention. If she crafts the right run and finds that amplitude on her switch hits that few other women can match, she’s very capable of bringing home another medal for Japan. In her second Olympics appearance, Germany’s Cakmakli has shown impressive improvement, qualifying for the finals in seventh. With a big switch 720 up top and several switch hits later in her run, she looks more comfortable skiing backwards than forwards. While she’s certainly a long shot for the podium, her innovative approach will be rewarded if she skis at her very best in the finals. While it’s a stretch to say that this fifteen-year-old from China will make the podium, her runs are worth watching just to see what real halfpipe skiing fundamentals look like. Under the tutelage of veteran Canadian pipe skier and coach Mauro Nuñez, Zhang and the rest of the young Chinese team are displaying real potential with the kind of confident, fluid skiing in the pipe that sets the top of the field apart from the rest. True, the trick level isn’t there yet. But watch Zhang ski, and it’s easy to imagine her absolutely crushing it in competition in a few years.